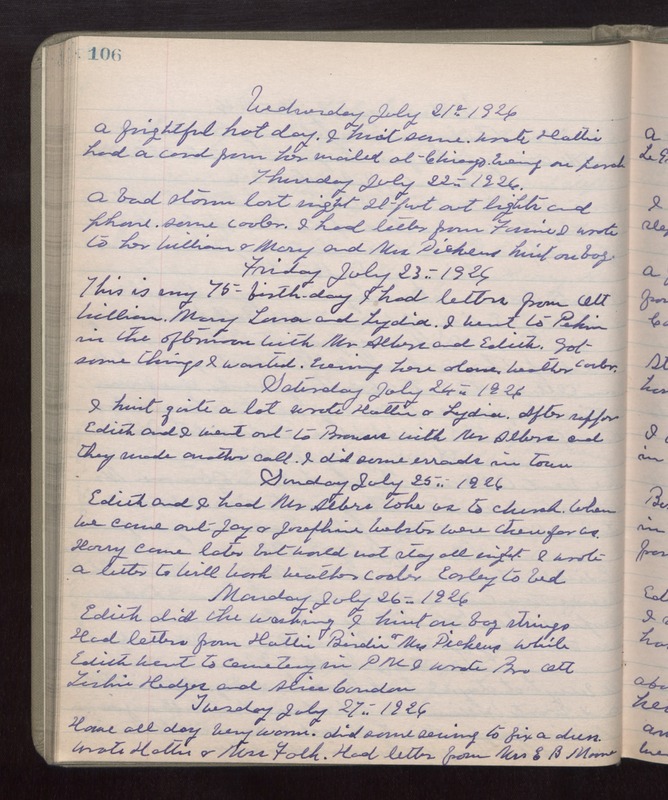 Wednesday July 21st 1926 A frightful hot day. I knit some. Wrote Hattie. Had a card from her mailed at Chicago. Evening on porch. Thursday July 22nd 1926 A bad storm last night. It put out lights and phone. Some cooler. I had letter from Fannie. I wrote to her, William & Mary, and Mrs Pickens. Knit on bag. Friday July 23rd 1926 This is my 75th birthday. I had letters from Ott, William, Mary, Laura and Lydia. I went to Pekin in the afternoon with Mr Albers and Edith. Got some things I wanted. Evening here alone. Weather cooler. Saturday July 24th 1926 I knit quite a lot. Wrote Hattie & Lydia. After supper Edith and I went out to Browns with Mr Albers and they made another call. I did some errands in town. Sunday July 25th 1926 Edith and I had Mr Albers take us to church. When we came out Jay & Josephine Webster were there for us. Harry came later but would not stay all night. I wrote a letter to Will Work. Weather cooler. Early to bed. Monday July 26th 1926 Edith did the washing. I knit on bag strings. Had letters from Hattie, Birdie & Mrs Pickens while Edith went to cemetery in PM. I wrote Bro Ott, Tishie Hedges and Alice Condon. Tuesday July 27th 1926 Home all day. Very warm. Did some sewing to fix a dress. Wrote Hattie & Mrs Falk. Had letter from Mrs E B Moore.